At times you may want to allow the end user to save GridView data into CSV format for further processing (say for opening later in Excel). Doing so using server side code is quite common. However, this requires an extra round trip to the server. You can also convert data from a GridView into CSV using jQuery. The former technique is good if you wish to present download dialog to the end user whereas the later (jQuery) technique is good if you want to present the CSV data on the screen so that user can copy-paste it as per his requirement. This post discusses the later technique of converting GridView data to CSV. For an example of the former technique read this article. Consider a following GridView that shows the Customers table from Northwind database. For the sake of simplicity only first 10 records are shown. As you can see the web form has a button to initiate the CSV conversion. The converted CSV data is shown in a Text Area. 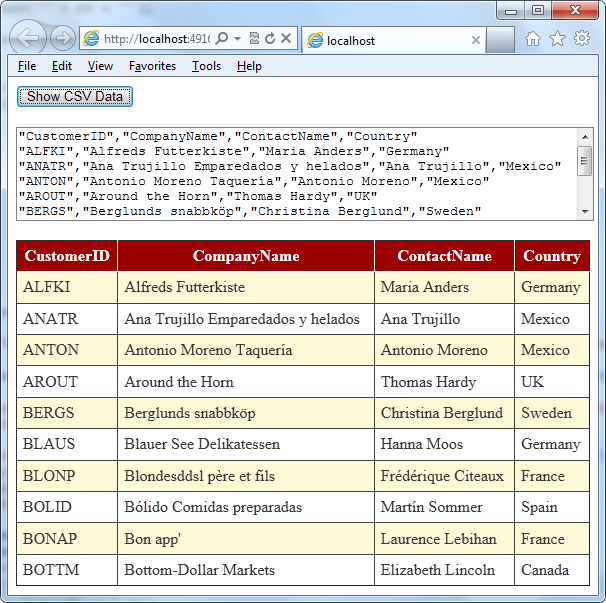 Let's see the jQuery code that generates the CSV data by reading it from the GridView. The ready() function wires a click event handler to the "Show CSV Data" button. Inside the click event handler you find all table rows (<tr> elements) from GridView1. All the <tr> elements are found using find() method. The outer each() iterates through all the <tr> elements. Then all <th> (header cells) or <td> (data cells) elements are found. Another each() iterates through all the <th> or <td> elements. The text() function returns the text content of the corresponding <th> or <td>. If the data contains double quote characters they are replaced by two double quotes. The push() method then stores the replaced text in headerArray (for <th>) or dataArray (for <td>) respectively. The headerArray and dataArray is added to another array - rows - by joining its elements. While joining the elements a comma is used as an element separator. Finally, elements of rows array are joined using \n as the element separator. This way each row of data will appear on a newline. This will give you the complete CSV data from the GridView in a variable - csv. The CSV data is then displayed in TextArea using val() method.